I took this photo from the Liberty Memorial in Kansas City. See my other photos to see pictures of the liberty memorial and learn more about it. I went to the Liberty Memorial with the sole intention of taking photos of it but when you look out and see this scene it would almost be wrong to not take a few pictures. For those not familiar with the Liberty Memorial its perched on the top of a large hill that looks out over Kansas City. 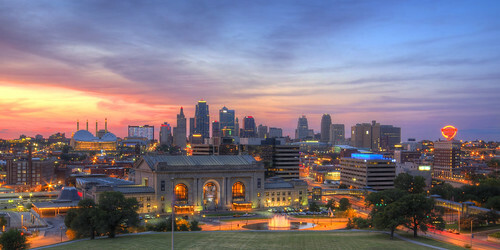 It offers a great vantage point of the Kansas City Skyline. I actually returned to this spot several times throughout my photo shoot as the sun went down. This was one of the last photos I took before leaving. It was getting really dark by this point. I actually thought it might be to dark to capture the colors in the sky but a long exposure fixed that and the result was pretty good.